Richard Amon celebrates with the premiership trophy after a nine-goal performance against Richmond in the Grand Final. Image: Nerissa Turner Photography. The Magpies are VWFL premiers. 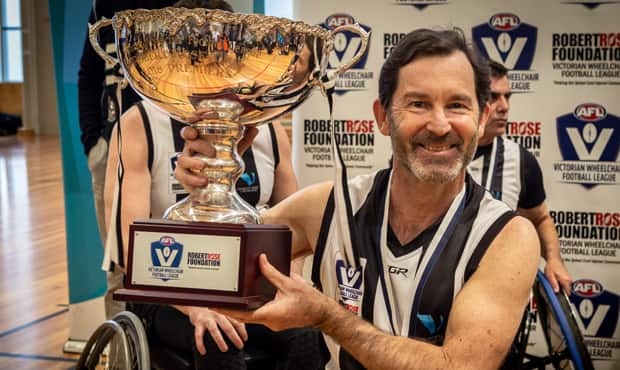 Silverware will be finding its way back to the Holden Centre after Collingwood’s wheelchair team proved too strong for Richmond in Sunday’s inaugural Grand Final. The result was comprehensive, with captain-coach Brendan Stroud and his team turning a 36-point half-time lead into a 60-point victory. “I couldn’t be prouder of these guys,” Stroud told broadcaster My Sport Live. A star-studded Magpies line-up delivered on the potential they’re offered all season. Forward Richard Amon scored nine goals, Brett Newman added three and defender Orfeo Cecconato took home the Robert Rose Medal for best afield. Orfeo Cecconato accepts his Robert Rose Medal from former Collingwood president Kevin Rose. Image: Nerissa Turner Photography. Collingwood president Eddie McGuire and CEO Mark Anderson were just two impressed onlookers of proceedings, with the Boroondara Sports Complex at near capacity for the league’s first decider. “We’ve had a wonderful Grand Final and are bringing a bit more silverware back to the Holden Centre,” McGuire reflected. Amon, who doubles as the CEO of Disability Sport and Recreation, was most proud of the awareness the VWFL has raised in its debut season. In addition to participation numbers skyrocketing, the league has also reached a larger audience. “We’re seeing people living their dreams and being able to become active, who haven’t been active for a long time,” Amon said. “The sport has exceeded all expectations, but mainly it’s provided a strong message to the broader community that this is what’s possible for people with disabilities. Collingwood captain-coach Brendan Stroud reacts to the final siren. Image: Nerissa Turner Photography.